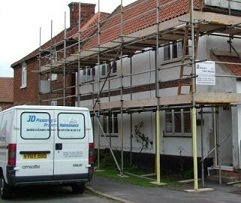 JD Plastering have been maintaining business premises and private residences in the East Midlands, Lancashire & Yorkshire regions for many years. In this time we have steadily grown our business on the basis of quality workmanship, reliability and the ability to bring projects in on budget. We are fully insured and operate a stringent health and safety at work policy. With a highly trained and experienced team we can bring your dreams to life. Should you require any further information, do not hesitate in contacting us via phone, email or our enquiry form.